Maharashtra State Transport Buses to Offer Free Wi-Fi! Next time when you are traveling in Maharashtra State Transport’s AC buses, you may be in for a surprise! 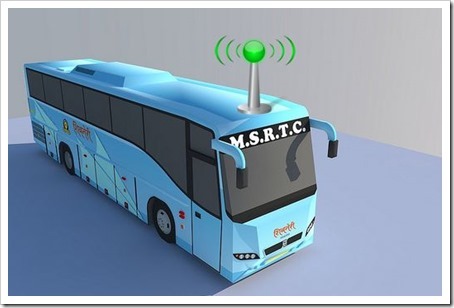 According to a TOI news, MSRTC will be installing wi-fi sets in around 100 Shivneri Volvo buses connecting Mumbai and Pune that will enable bus passengers to access internet completely free of cost. I personally use these buses quite often during my travels to Mumbai and 3-4 hours (one way) on these buses generally are quite un-productive. The only thing probably you can do is read books, newspapers or play games on your mobile. Yes, you can use the data services on your smartphone, but connectivity is quite poor once you leave the periphery of both the cities. With introduction of free internet on the buses, the journey is sure to be more productive and appealing. Also, the passengers on Pune-Mumbai Shivneri buses are mostly day trippers who are either professionals or businessmen. The six to seven hours they will end up spending in the buses (to and fro) are sure to be more fruitful. Not only will these buses have Wi-fi, but will also be fitted with CCTV cameras and GPS tracking that will help in monitoring movement of buses from central control room as well as deter bag-lifters and thefts that are quite common on these buses. From passengers point of view, it is great because they do not have to pay any additional money for all these extra services. MSRTC will cover the expenses of these extra features by offering advertising on these AC buses. The system will work similar to how hotspots work. When the passenger connects the smartphone or laptop to the available wi-fi network, they will be asked for details such as email id and mobile number. They will then be sent login credentials to their mobile, which could be used access internet through the journey. MSRTC plans to maintain and store all the records of people accessing the internet, so as to ensure that no one uses free internet services for destructive purposes. Internet will come to these Shivneri buses via direct satellite link-up. So, next time you are on one of those buses try to make use of the free wi-fi services and don’t forget to let us know your experience using it! "Maharashtra State Transport Buses to Offer Free Wi-Fi! ", 5 out of 5 based on 1 ratings. Technology Magazines: Is there a future for them? I think we are expecting too much from government of India….. At least they provide some basic services. Thank God. These wifi service is now available in maharashtra from mumbai to pune or pune to nashik or pune to aurangabad ( all shivneri or AC msrtc buses )they make us log in to http://www.kivi.com and then we r directed to voot website where we r having pre loaded data only the problem is as soon as u leave the bus station within some minutes the wifi hotspot is turned of by the drivers and thats not fare ? One point I would like to bring is, I am sure people are already using the travel time for good productivity using their 3G mobiles / tablets. You are paying for 6-7 hours of expensive prices to the telcom companies. Now if people can divert this 6-7 hours of connectivity to free wi-fi, they can save on lot of money. Bro it will have direct satelite link … so these wifi hotspot is have preloaded data like video and movies etc … so it will not affect the connection or speed on wifi tough ur not have ur 2G/3G signals ?? I believe offering free wi-fi on Maharashtra State Transport’s buses is an excellent idea, business professionals can then be much more productive on their journey to work than if they were driving. Is there any restriction on the bandwidth and data allotted to each user? An honest doubt- How do they keep track of the records of the activities of the people using VPN or TOR? OR the combo of both of them OR https proxies OR proxy chaining? If you are using a proxy, I am not sure if they can track the activities you do… and probably that is a good idea …isnt it?